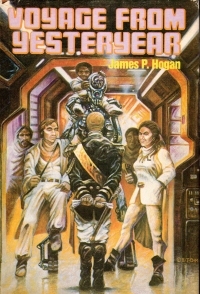 As you might recall, gentle reader, I am a pretty big fan of James P. Hogan (see also the reviews for The Multiplex Man, Paths to Otherware, The Legend That Was Earth, and Martian Knightlife). However, do not let the stretches of time between those book reports diminish my claim. That I apparently haven’t read something by Hogan since 2009 more indicates how time flies when you get older. The exposition of this book: In the near future (nearer to us than to readers in 1983), international relations are tense (the Soviet Union is still around, and the Chinese/Japanese alliance (?!) is a rising power). An international space probe is launched to a habitable planet around Alpha Centauri. At the last minute, the building blocks of human life are added with the thought that the robots and computers on the probe can build habitation and factories and whatnot that will then build human children to live on the distant planet to ensure humanity survives in case of a cataclysm on Earth. A major war erupts, and an American civilization rebuilds first and sends a generation ship to the new planet, Chiron, to enlist the residents there in the predicted war against the Eastern Asians, who send their own ship four years after the Americans. In the twenty-year journey, the Americans on the Mayflower II have developed their own politics and expectations of their first encounter with the Chironians, and they’re stumped when confronted with the libertarian utopia that has evolved in the forty years when the society with its abundant technologies build itself from scratch. That’s the setup, and the bulk of the book describes the interaction and adjustment or lack thereof of the individuals and institutions to the Chironian way of life. About halfway through the book, I thought perhaps the book would take a twist akin to a book I’d read some time before — Code of the Lifemaker. Which, as it turns out, is Hogan’s next book. But this book did not take the turn I expected, and it was straight forward and earnest throughout. Thematically, the book deals with how a society might build structure itself if the base understanding of life and the universe was one of abundance instead of scarcity. How would they organize politically? How would they make their lives meaningful? The book goes into some alternative science premises that Hogan used a lot. As I was reading, I was thinking the Chironian society was like something I’d seen before in The Probability Broach by L. Neil Smith. Overall, the sweeping themes and meta nature–with political subplots and chapters on quantum physics (with which I’ve tried to grapple with on numerous occasions recently) bogged down my reading of the book. I would have enjoyed it with fewer characters and sidelines, but that’s probably because my attention span has shortened over time. Also, I think Hogan’s hopeful thesis about how people raised in abundance and without the death-focused strictures that I assume he associated with Christianity and old timey religions would behave. Forty years later, our Western society’s generations raised since this book came out, have proven to be quite petty instead of interested in all being little Howard Roarks and Dagny Taggarts. Still, an interesting concept and a breath of fresh extraterrestrial air amid the Shakespeare comedies I have been reading this year. As part of a continuing series called “Brian J.’s Three Quarter Life Crisis” (previous entries include “Brian J. Learns A Martial Art”, “Brian J. Does Triathlons”, and “Brian J. 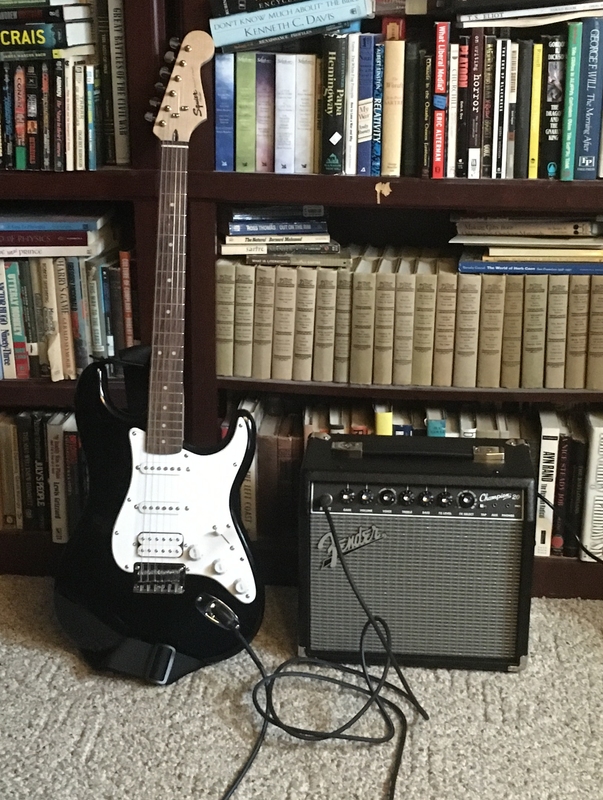 Publishes A Book Of Poems“), I took gift cards from Christmas and my recent birthday and bought an electric guitar. To be honest, it is not my first. When I was at the university, I bought a bass guitar and noodled with it for a while, including actually getting together on a couple occasions with a couple guys with other instruments and jamming with them (that is, strumming or picking the bass guitar clumsily while they picked their instruments clumsily, or in the case of my sessions with The Variation Machine, actually pretty good). But I did not pursue it and did not stick with it with any discipline. I had a lot of time–witness the number of poems and short stories from the time as well as the spoken history of the era. But I lacked patience. Before I got the bass guitar, I asked for a keyboard for Christmas in 1990, and I got two (the reduplicative benefits of a broken home–one from the mother and one from the father). I tinkered with it a bit, trying to do a little autodidactic learning on it, but I could barely read music and play with the right hand, sort of. I learned “Suicide is Painless” (the theme from MASH), but little else. I wrote a song for a girl named Peggy who was in my Bio 2 class and another English class, but when I told her, she and a friend mocked me through one particularly long Bio 2 lecture. The song even featured using the left hand. Was it any good? I’ll have to ask the beneficiary of Peggy’s disdain: My beautiful wife, who can play all the instruments and even some that have not been invented yet. Where was I? Oh, yes, I’ve not had much luck with follow through on the musical instruments. I’ve not had a lot of luck with autodidacticism in other areas. Like trying to learn software programming. I mean modern software development. I’ve written programs before, but I’ve not had much luck with putting all the pieces together on a language or an application. Part of it has been time, of course–since I’ve had children and a family, full evenings dedicated to a hobby has disappeared. So I don’t have the time. But I have learned patience. I definitely credit the years of martial arts classes for this. When studying or playing with anything in the past, I’ve always found that I learn a lot rapidly and take pride in it, but then I plateau and become disappointed that I’m no longer rapidly advancing. I end up putting things aside, and going onto something else. But I’ve learned how improvements become more subtle over time, and just putting in the effort and time generally leads to improvement. So I’m hoping to apply that lesson to learning the guitar. A little bit of practice every day, and eventually I will learn it. He seems very patient. And British. And if this does not work, I will get lessons. Another thing I’ve learned in my crisis journey is that even though I’m not friendly enough or extroverted enough to natively join a community, I can pay someone to tolerate me enough to teach me something. One would think that I would have learned this in my youth, when I spent tens of thousands of dollars for professors to humor my dreams of being a best-selling author or famous poet. Oh, but no. At any rate, ask me again in six months about my progress to see if I can stick with it as much as I’d like to think I can (this time). Also, drop me a line if you want to be in my rock and roll band. I have a cool idea and concept, but I’m not sure how well my voice can hold up to grindcore, and my children’s voices haven’t changed yet. 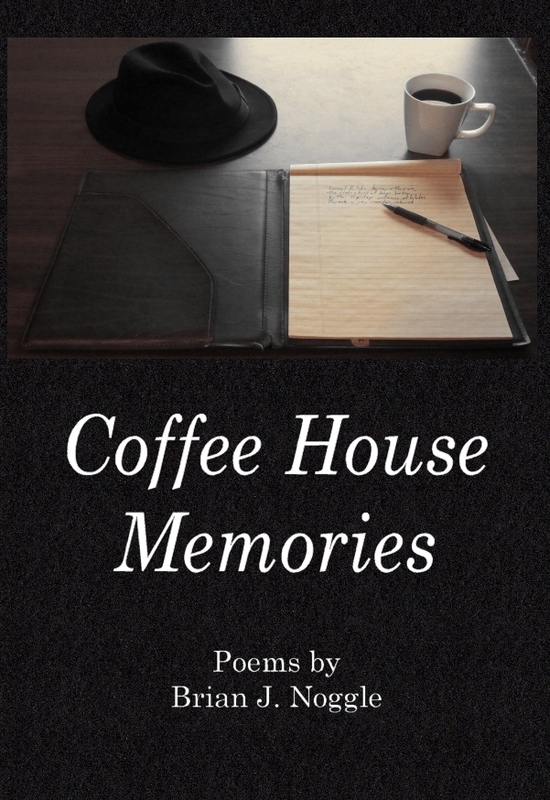 My collection of poems, Coffee House Memories, is available in paperback. Dustbury has a post about the theme song from The Bob Newhart Show that appeared in a longer form on an album; playing off of another user’s comment, I gave a partial list of television theme songs that charted, including the obligatory John Sebastian, Mike Post, and Henry Mancini numbers. Then, after I submitted the comments, the livestream of WSIE played “Moonlighting” by Al Jarreau. The theme from the show of the same name, which charted in 1988 and garnered two Grammy nominations. Relax, WSIE. I could not forget Al Jarreau. He is from Milwaukee, after all, so we’re practically related. The blogger wants entertainment with his classics. You know, he’s not far off in deriding more modern classics–particularly the stuff that comes out of the 20th century. Classics before that are generally popular. I mean, Shakespeare wasn’t high-faluting. The novels of Austen were popular and entertaining to their set. Hemingway, sure. Faulkner–well, that’s 20th century academic classics talking. With a lot of things in translation, what’s ‘classic’ is what’s based on an academic’s taste and inclination in translation as well. I always assign an asterisk to what I read in translation anyway. And the aforementioned Indianan made it through War and Peace but I didn’t. I can tell you why: It’s keeping the characters straight. It’s bad enough when it’s a big cast in a broadly focused saga; it’s far worse when each character has multiple appellations depending upon who’s talking to him. Popular classics from yesteryear become less approachable when the argot and manner of expression changes, whether across cultures (such as War and Peace and other Russian classics) or centuries (one can appreciate Shakespeare’s occasional turn of phrase without getting the jokes). To really grok the works like that, you really have to dive into them and read a bunch from the era or culture. Then you’ll be steeped in it and might even get the jokes without the footnotes. Back in college, I did get the jokes in Shakespeare because I was concurrently reading Jonson and Chaucer and contemporary poets, so I was conversant in Middle English. But I’m not that way now, and it’ll take a little work to get back to that. But it does take a little effort to really get into those classics, and they’ll be more entertaining if you’re so inclined. I am, mostly because I’m pretentious and want to read the classics. But it’s a matter of taste, and not everyone is going to like everything. But, yeah, James Joyce’s work might be the last couple of things on my shelves that I would read should medical science make us virtually immortal. Perhaps the message was on-point in 1997, but we’ve got a couple self-actualizing generations that have sought meaning outside work (or meaningful work instead of careers) since then. So many of the lessons aren’t applicable to more modern readers. I took an older guy somewhere during my early-morning Uber shift, and we got to chatting about retirement. He was in his early sixties and was thinking about retirement in the next couple of years or so — he’d reached all the retirement “qualifications” in terms of his age, length of service, and so on — and when I asked him what he was going to do after retirement, he said quite simply, “I don’t know.” He had no outside interests other than his work, he said, and had no hobbies or anything to keep him occupied when he would quit working. This set off all sorts of alarm bells in my head, because I’d confronted the very same thoughts when I planned on retiring back in 2016 on reaching age 62 (which seems to be the “killer” age discovered by the researchers). Worse than that, I either know men personally or have heard of many instances of men who have died soon — very soon — after retiring early. (When men retire at a later age, they paradoxically seem to live longer, as the study shows.) Sometimes, men die within six months of getting their gold watch, after many decades of working with little or even no time off for illness. Where I differ from the study is that I think I know the real reason why this happens. Perhaps I’m a little closer to the millenial mindset than I like to admit, or perhaps I’m just laid back, but their experience differs from mine. On the plus side, people in my line die at sixty, give or take, so I won’t have to worry about dying after I retire. As you know, gentle reader, I have been known to read comic books even though I’m ::cough, cough:: nearing fifty years old (see Personal Goal Reached, Revisited and Things To Do In Tampa While Traveling For Business). Whenever I’m asked why I haven’t seen the new Masters of the Galaxy (or whatever it’s called) movie, I simply reply that I quit reading comic books at about age 11*, as should every adult. The storylines are boringly repetitive, the action equally so, and the characters’ emotions are, well, set at comic-book level (which is what’s required for a preteen audience who don’t have the mental software to appreciate or even recognize complex emotional issues). It’s fine for kids, in other words; but if someone age 50 tells me he’s still seriously into comic books and/or their movie derivatives, I actually start to wonder about his mental maturity. You know, I sometimes wonder about what it says about me that I still pick up comic books from time to time. I do prefer the ones from my youth, though; stuff that I have seen from this century, if you can believe it, is more simplistic as the focus has shifted from the story and the writing to the pictures, as though the pictures themselves are the worth of the thing. No, not really. The stories are. But as far as being repetitive, you might recall that I’ve noticed how much Shakespeare mixes and matches the same elements in his plays. And, to be honest, is an issue of Jennifer Blood: Born Again that much of a step down from men’s adventure paperbacks? Probably not. Suddenly, I’m all defensive about my reading habits. Aw, who cares, read what you want. Classics, comic books. Just have something interesting to say about them. Of course, yesterday’s post needs to be followed up by a But I Really, Really Need To Buy This One post. Yesterday, we headed up to ABC Books to get some gift cards for the coaches of my oldest son’s basketball team for the thank you cards he’ll give them at the end of the season (or sometime–he’s been known to forget such cards for up to six months when they’re exhumed from his desk or backpack and given to the recipient). And we couldn’t just get gift cards (although I must have done that on one or two occasions last year). So I brought home a couple things to read someday. The Celts, a history of the Celts which was in the World Religions section for some reason. Strangely, I might already have a copy of this floating around somewhere. Virtue and Happiness by Epictetus. Wait a minute, I thought this was Epicurus. Since it’s Epictetus, I might have already read it. Ah, well, I’ll read it again, expecting Stoicism now that I look at it more closely. The Beauty of Gesture, a book that equates Tai Chi with playing the piano or something. It looks interesting. The Tao of Christ. In my reading of the Tao, I’ve noticed some similarities to the parables of Christ. This looks at it in depth. 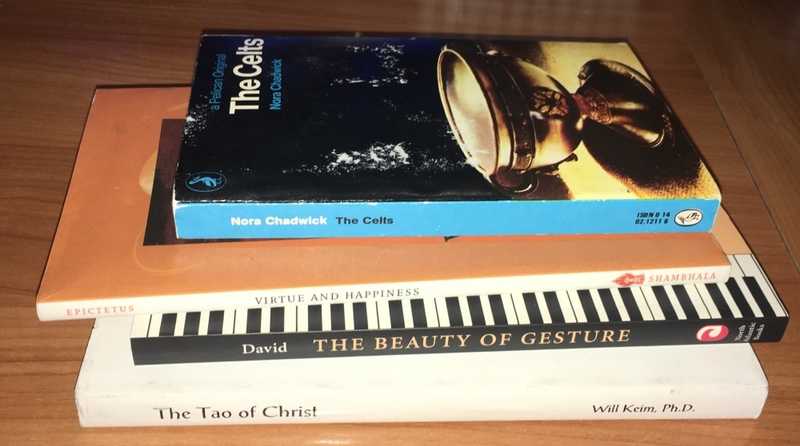 Prediction: I’ll read The Tao of Christ first. If history is any guide, I’ll read one of the four this year, although the Epictetus might also make its way into my annual reading. Of course, I think 20 unread books in a home means that nobody lives in the home and it’s being staged for sale by a realtor. For the record, I have almost 20 unread books that I bought at ABC Books last year. Frankly, I’m stunned that I’ve only been to ABC Books five times in the last year. And what restraint! But, yeah, Nogglestead has a couple of unread books, but that does not stop me from buying more. Police in Springfield are looking for a man who stole from items from Vintage Stock, including display swords. Store employees say the swords are not made to be weapons, but could potentially be used as such. Police say prior to the theft at Vintage Stock, the suspect stole a Dale’s Roofing truck, which hit a Pontiac Grand Am at the intersection of Glenstone and Barataria as he fled the Vintage Stock store. To be clear, I’ve bought all the bladed weapons I own except for the halberd, which was a very nice gift from a D&D friend who asked me what I wanted for Christmas, and I said, “A halberd.” Because polearms don’t get enough attention in role-playing games and film, if you ask me. You know, sometimes, when listening to a contemporary pop song on the radio, I will tell my boys that the latest Chainsmokers or Shawn Mendes ditty is a vapid collection of unconnected lyrics, drum machine beats, and canned musical chords. Unlike the songs that I grew up with, which were one harp or viola short of being a symphony, dammit. Like the book on Raphael, I hoped to read this book during football games. 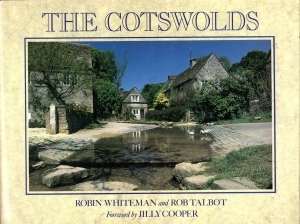 I picked it up last fall after reading two books with Cotswold/Catswald in the title (Cotswold Mistress and The Catswald Portal). But, as I mentioned in the report on the book on Raphael, I didn’t end up watching a lot of football last autumn, so this book, too, got pushed off but now serves as an interlude between the Shakespeare plays I’m working on. The book suffers from a similar malady to the Raphael book: A high prose to image ratio, and that the captions beside each image go beyond what you’re looking at in the picture itself. An image of a cottage or a landscape with a distant mill in it will mention the region’s history and role in the wool trade in the Middle Ages (hint: almost whatever the village, it was probably involved). That said, I really enjoyed the book. The sense of old one gets from European cities definitely trumps the 200 years, maybe, you get out here in the Middle Western and Western parts of the United States. Combining this book with the travelogue of Kim du Toit, who spent part of last year in England, and I might someday be tempted to leave the relative safety of the middle of this country for England. I’d better hurry while there’s still an England, though. At any rate, a cool book. A step up from the normal tourist takeaway books I read about different regions or the coffeetable photography books about San Francisco or New York. Grilling Tips from Brian J. As you know, gentle reader, the Internet and newspapers last year wrote a flurry of articles–well, someone wrote an article, and the rest of the twenty-three-year-olds in professional journalism copied it–about the dangers of using wire brushes to clean your barbecue grill. The story goes that a bit of the wire from the brush might fall out, stick to your grill, get stuck in your meat, you might eat it, and it might upset the stomach of a shark that eats you or something. 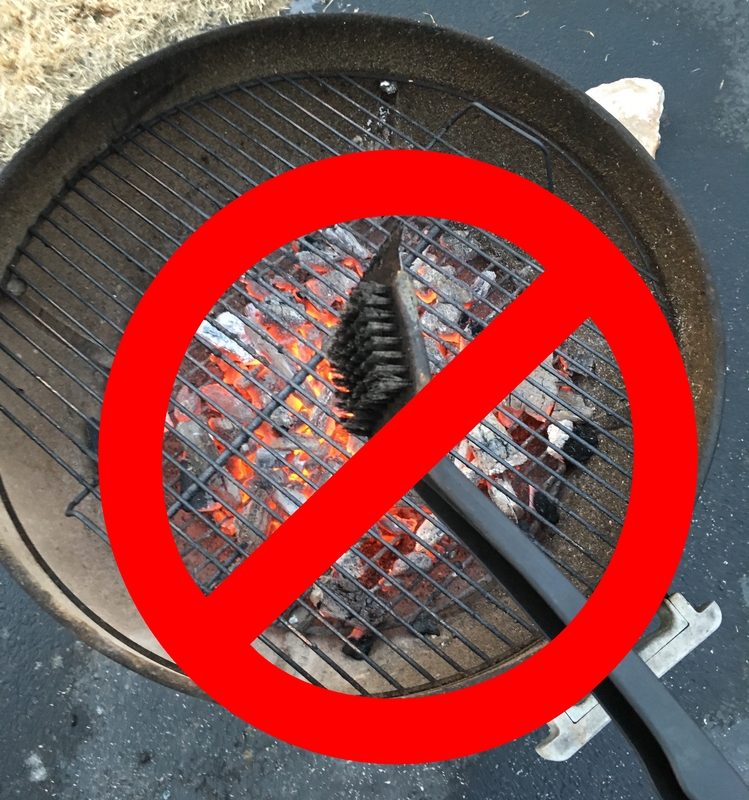 Gentle reader, I heartily agree with everything I read on the Internet, and don’t think you should use a grill brush to clean your grill! 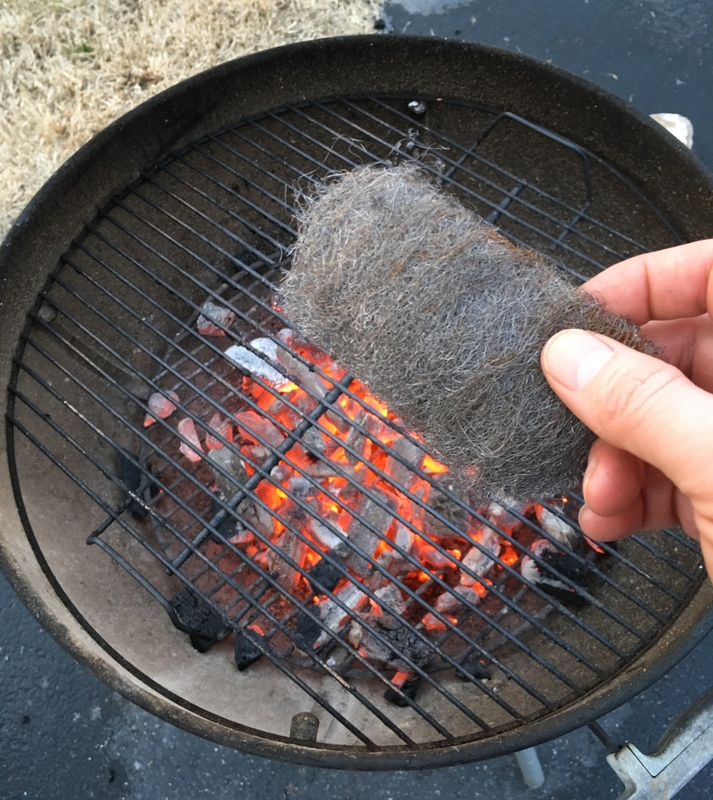 Instead, use steel wool. The smaller metal fibers will have a more pleasant mouthfeel and texture when they get stuck in that meat that the Internet thinks you shouldn’t be eating anyway since it takes fifty acres of land better suited to sustenance-level farming with no herbicides and only cutesy little signs with emoji to keep the animals away to produce four ounces of round steak. Or so I read on the Internet when previewing this post. A little bit of rust on the steel wool will also provide a little bit of umami–without the urban legendary dangers of Madison Square Garden. As you know, gentle reader, I sometimes like to page through books of poetry, art, or photography whil I watch a sporting event such as a football game or a baseball game, where I can browse a small chunk, watch a play, peruse a bit, watch a play, and then ingest a bit more during commercials. But, Brian J., you did not do that much this past football season! What gives? Well, gentle reader, this was not a good year for the Green Bay Packers, as you know, so I did not stick with football games for the full three hours. Also, some of the books I picked out had pretty high text-to-image ratios and required a bit more attention than I could muster during football games. This is one such volume. 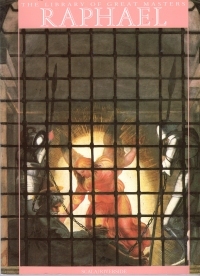 It’s a collection of paintings done by Raphael accompanied by a biography. The text did not lend itself to easy perusal for a couple of reasons. For one, it’s a pretty detailed art history piece, where we learn about with whom Raphael worked in his youth and the influence that myriad Italian Renaissance painters had on him and in which of his works. As I have no idea who any of these guys were, I did not get much from that. Secondly, the book talked about paintings whose images were pages away, so by the time I got to the painting, I’d forgotten what I’d read about it. So I couldn’t read it during a football game. So I read it as part of my breaks from the volume of William Shakespeare that I am reading currently. The book still had the same drawbacks to reading at length, but I got through it. I want to flip through these books to get a sense of what the author’s work looked like and maybe so I can say something intelligent about it. I’m not sure I could tell a Raphael from another Renaissance painter, but I can tell one from a Rembrandt, although this book says Raphael used chiaroscuro as well–but to be honest, Rembrandt used the effect better. Also, although they must have been getting better by the time the cinquecento rolled around, the proportions of the bodies are still a little off. You look at some of the shoulders on the people relative to their necks and heads, and you have to wonder how their eyesight was. At any rate, I’ve learned the difference between the quattrocento and the cinquecento from this book, so I’ve got that going for me. For those of you who don’t watch football and thus are not exposed to Renaissance art, that’s the 1400s and roughly 1500-1530 in Italian art. Worth a browse, but probably better if this is not your first exposure to Renaissance art. 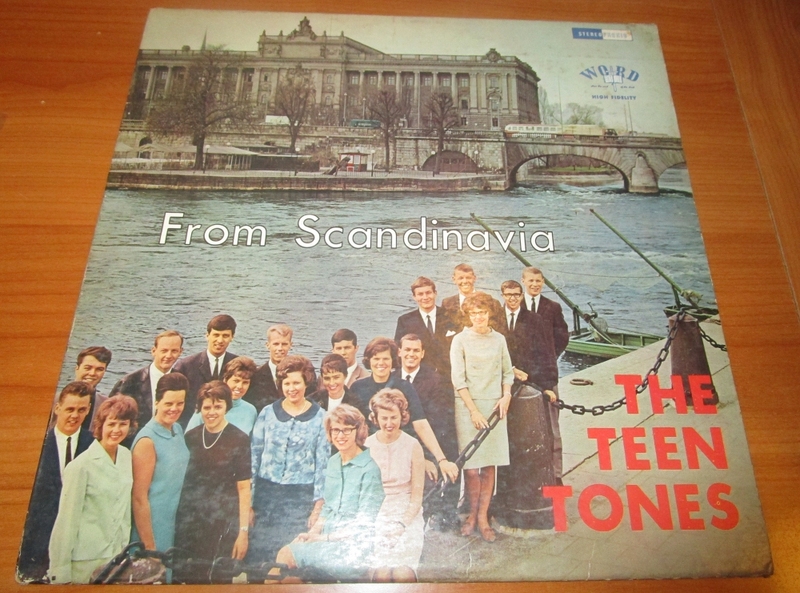 As I mentioned, I picked up a Scandinavian gospel album from a band called the Teen Tones. The album itself is called, simply, From Scandinavia. My Internet research doesn’t give it a specific year. Discogs recognizes the album but doesn’t give it a release year. The back of the record says the band formed in 1962 and has gotten popular because they could play in clubs and evangelize to the kids dancing the Frug. Or something. Are those really teens? I suppose they could have Dominican birth certificates attesting to it. 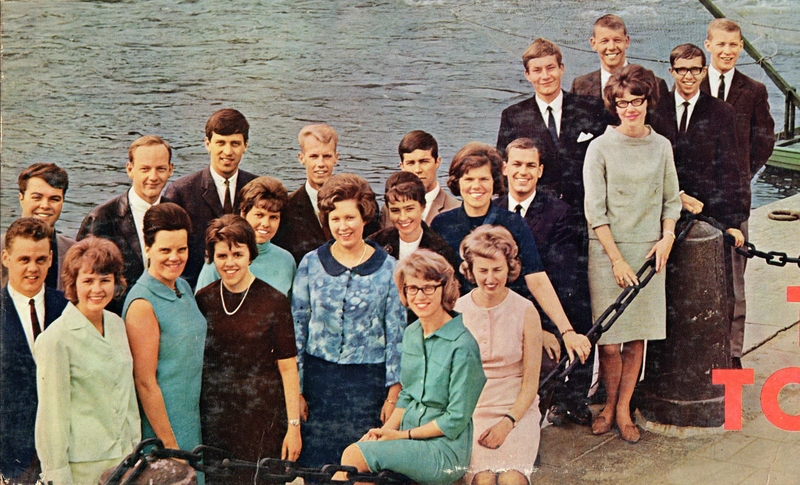 Or a couple of years have passed (remember, the Swedish Gospel Singers released their album Take a Little Time To Sing in 1966, so it’s fair to guess that this album came out right around that time. So it’s feasible that these “kids” were actually over 20 by the time the record came out. They’re dressed like adults, unlike twenty year olds from today. They’re dressed like our grandparents looked (or your great grandparents if you’re under 20) in old photographs. They’re Europeans, who tend to look older than Americans anyway. Also, they’re not twenty year olds from today, who tend to look younger than their counterparts ha’centuries ago. This is not just dress (See the first bullet point above), but also in skin and general health. Better nutrition, I guess. Does it matter? Not really. Did they take the world by storm? Apparently not. It’s a pleasant record for a Sunday morning, though. That’s about the state of all my records: They’re pleasant to listen to as background music. Also, note that the album’s label, Word Records, was associated with A&M Records for a long time and remains a going concern with a lot of contemporary gospel acts. Also note that my research has lead me to a Web site called On A&M Records that is apparently not affiliated with the label but has an extensive history of the label, including year by year recaps from 1962 until today and bios on lots of its recording artists. So the rest of my Sunday is spoken for. This play brings a number of the Shakespearean tropes into high relief, and we can see how he swapped the parts into his plays. The high level plot is that a duke likes a lady who is in mourning for her brother’s loss, and she’s not into the duke. A young lady is separated from her brother in a shipwreck, falls in love with the duke, and dresses like a man to be his embassy to the woman the duke loves. The woman falls in love with the lady posing as a man. We’ve got a subplot about a relative of the lady and his friends who trick a servant into thinking the lady is in love with him; and the brother lost in the shipwreck shows up just in time to take the sister’s place as the woman’s husband. I mean, it’s an amusing scramble, but you can see the shipwreck motif; the woman dressing as a man as helping the man she loves pitch woo to another; and so on. I’m pretty sure if I studied more deeply into sixteenth and seventeenth century drama, I’d really see how often these same themes were mashed up. What, I’m not already that big of a student of this era? Hey, man, I’m a reader, not an academic. It does make me want to break up the comedies with a tragedy or two, but one of the things I do is read books in the order in which they’re presented. I don’t read the last page first, and I don’t read the prophets before the chronicles of the kings. Which is why it often takes me a long time to get through things. Libraries are putting books in storage, contracting with resellers or simply recycling them. An increasing number of books exist in the cloud, and libraries are banding together to ensure print copies are retained by someone, somewhere. Still, that doesn’t always sit well with academics who practically live in the library and argue that large, readily available print collections are vital to research. At Indiana University of Pennsylvania, the library shelves overflow with books that get little attention. A dusty monograph on “Economic Development in Victorian Scotland.” International Television Almanacs from 1978, 1985 and 1986. A book whose title, “Personal Finance,” sounds relevant until you see the publication date: 1961. The burden of the future is partially lifted from my shoulders. Between the Noggle Library at the end of my retirement (projected to be somewhere over 20,000 books, some 15,000 of which I will not have read) and the random crafters making pleasing arrangements of books with pleasantly colored spines, certainly we’ll do what the monasteries did a thousand years ago. Now, to start a nonprofit that accepts donations from these universities to turn actual academic work (and “academic” work of the latter half of the 20th century) into the 21st century equivalent of macrame instead of cat litter. Full disclosure: I once tested the first version of the Yesterday’s News cat litter Web site. Also, the remainder of the books left over from the Friends of the Springfield-Greene County Library book sale, twice a year, are ground into cat litter for Yesterday’s News. So I’m not joking about actual books being ground into stuff for cats to pee on.